Burst pipes, overflowing gutters, flood-inducing rains and water seepage often cause water damage in residential homes. If left unchecked, this can lead to massive structural damage, loss of possessions and contamination in the form of mold. Sever backup and pipe burst can happen in areas of the house that are not visible to the naked eye. These are perhaps the worst kind of leaks as it not only damages the foundations of the house but also leads to contamination, which can often be a much more serious problem than the water damage itself. According to World Health Organization estimates, more than 1 billion people worldwide do not have access to clean drinking water and more than 4,900 people die due to waterborne illness. Our part in ensuring our continued future depends on what measures we take today to conserve water and protect against water damage. A hissing sound of water running even when the plumbing is not in use. Water damage restorations isn’t cheap so it is always a good idea to get the best in the business to take care of these issues so that they do not escalate to a degree that causes major business interruption, financial burdens and irreversible contamination. Once water is contaminated, it facilitates the growth of mold that can seriously increase the cost of remediation. The existence of mold can lead to serious health risks and even diseases. Once water damage is detected, it is critical to have it remediated as quickly as possible. Severity of water damage can also depend on the type of water itself. Water is divided into three categories when it comes to contamination. Clean water is generally not harmful as it comes from a clean water source such as a faucet or direct water line. A leakage of clean water should still be treated immediately as if left alone the water can be easily contaminated and escalate to a more dangerous category. This type of water generally leaks from dishwashers, washing machines, and toilets and can contain possible contaminations of bacteria and viruses. It is much more dangerous than clean water as if left unchecked it can lead to catastrophic physical damage as well as health risks. This is the most dangerous category of contaminated water as it can cause serious illness and in certain cases even death if mistakenly or intentionally ingested. This category of water is normally contaminated with untreated sewage, chemicals, feces and harmful bacteria and viruses. This water is the life source for mold growth in homes and should be immediately fixed or replaced. Leakages caused by sewage damage or sewer backup are considered black water along with septic back flow, toilet overflow and flooding. Gray and black water contain pathogens and parasites that can lead to serious infections and diseases. 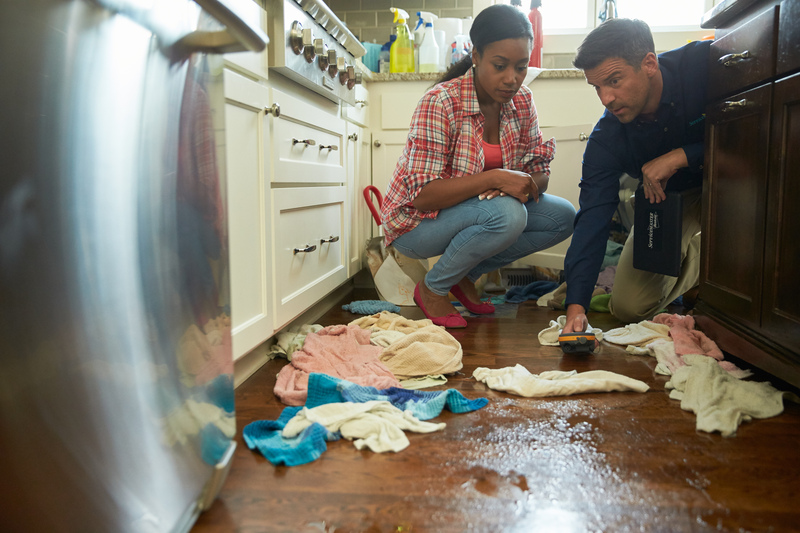 Even if you have a suspicion that their maybe sewage damage in your home or workplace, stay well away from that area and call in a professional immediately. The longer black water festers the greater the restoration and replacement cost as this contamination will spread quickly to other areas of the property. Water damage remediation and water extraction services require a team of professionals along with heavy equipment that includes dehumidifiers, extractors, air movers and driers. It is not enough to simply remove visible water from the impacted area as moisture is still left behind that can facilitate the growth of mold. Water damage remediation services offer a water damage assessment taking into account all factors. Once an assessment is complete the first step is to extract all the water from the affected area. Using heavy duty driers the walls, carpet, padding and furniture are all dried off until zero moisture remains. Then next step is the cleaning and restoration process for clothes, linen, books and documents. If they is any signs of mold and mildew damage this too is immediately remediated. The source of the leakage is identified and repaired at the source to prevent any further seepage. Following this procedure makes a full restoration from water damage possible but only if action is taken immediately. The amount of water damage that has been inflicted on a residential or commercial property is often classified into four different categories. Class 3: The worst kind of damage possible where water has saturated most of the property including ceiling, flooring and walls. Perhaps the greatest challenge of water damage remediation is the restoration process of valuables damaged by water. The restoration process involves replacing or repairing entire sections of the property back to its original state by replacing materials such as drywall and insulation while repairing and restoring furniture, tapestry and other valuables. Water damage from flooding can sometimes lead to serious cases of water damage where entire sections of the property have to be replaced which can be an expensive and arduous process. All water damage restoration jobs are unique as the amount of work required for each depends on a variety of factors such as the amount of area in the home that’s been damaged and how long the water has been present. Other factors can also include the type of water that is causing damage and the geology and topography of the landscape. Insurance company’s offer protection against water damage from flooding, burst pipes, and sewage backup. However, it is important that certain measures are undertaken to ensure that claim is accepted and a fair settlement is made. In the event of a flooding or burst pipe situation it is important to stay calm and to simply call in the professionals immediately. Trying to fix the situation by saving valuables and using DIY techniques to stem the flow of water is only going to complicate your claim procedure. There may be a good chance that your claim may be denied and you do not get compensated for your loss. This can put a huge financial burden on a person as water restoration is an expensive and time consuming process. In case of any water related emergency it is best to call in the experts so that they can help in accessing the situation and gathering evidence for filing an insurance claim. Even though doing nothing is counter intuitive to our natural instincts of saving what we can in the case of an emergency, it actually helps in making the restoration process much faster, easier and lighter on your budget. Water damage restoration experts will also often assist with the insurance claim process and provide you with all the necessary information that you would need to file a just and problem-free claim. The damage that water can cause to a property should never be underestimated. Water is a natural life giving substance that is also one of the most destructive forces of our natural world. It is both essential for life and can also claim lives if left unchecked. At the slightest signs of water leakage one should immediately contact a professional as even delaying slightly can have catastrophic long-term consequences. Need a professional water damage specialist to come to your home or business quickly? Contact ServiceMaster QRS, day or night, for speedy emergency service. We work with your insurance company. Call (773) 388-9200 today! It really helped when you said that the water damage should not be underestimated. I think my mom is guilty of this because, since the last time her basement has been flooded, she just cleaned it but never checked on it. To help her out, I believe I should advise her to call a damage contractor for an inspection. When my mom’s place has been flooded, she noticed that the water was slightly gray. If this type of water may contain possible contaminations of bacteria and viruses, I need to advise her to call a professional for an inspection. I will also forward this article so she will understand it better. Very helpful information share. Looking forward to more great content. My sister went to her shop and found out that there’s water in her kitchen floor. It was explained here that the pipes should not be left unchecked because it may lead to burst pipes and water damage. Furthermore, it’s recommended to hire professionals for quality commercial water damage restoration. It got me when you said that black water is a sign of a contamination of bacteria and virus and will cause devastation when a leak of this kind is ignored. If that is the case, then I will ask my parents to have the basement checked by a water damage expert. Black water has been leaking from somewhere for a while now, and mom ignores it because the quantity isn’t alarming. Hopefully, it hasn’t caused much damage yet. My brother went home last night and found water on the floor from his refrigerator. It was explained here that one of the reasons for water damage is leaking appliances. Furthermore, it’s recommended to hire professionals for quality water damage restoration. There was recently a small flood in my basement, so thanks for sharing this. I like your point about making an insurance claim. I’ll be sure to get the damaged analyzed first so I can document everything. I like your tips and try to do in to my real life. Thanks! Thanks for pointing out that repairing water damage isn’t a DIY project and requires professionals. My husband and I recently had a burst pipe in our home. We’ll take your advice and start looking for a professional to hire. I like how you mentioned that the damage water can cause to any property shouldn’t be underestimated especially since it can lead to the growth of mold and can cause even further deterioration. Having a team of professional water damage experts handle the situation is the best way to be able to prevent the spreading of further damage since they are well-equipped on how to deal with getting rid of mold. I’ve been having problems with mold growth lately and the ceiling keeps leaking even more so I think it’s time to call the experts to take a look at this. There might be a sign of potential leakage in my pipes since there are pooling areas on the ceiling of my basement. I’ve noticed that there is irregular water pressure on certain areas of the house which is strange. Since the water bill is also higher than normal, I might call a water damage restoration company to address this for me quickly. I know the content of your article and your article skills are always good. Thanks for sharing this article This content is very important to me, I really appreciate you.